The Saugatuck River rises in the Danbury Hills and runs for not much more than 20 miles before it reaches Long Island Sound. At its mouth, in present day Westport it is a wide river, but in colonial times there was a bridge a couple miles just upstream where the Old King's Highway crossed the Saugatuck. On the morning of April 28th, 1777, Benedict Arnold and the force which had opposed the British the previous afternoon at Ridgefield raced to hold this crossing and, they supposed, get between Tryon's raiders and their waiting ships and trap them on the wrong side of the river. In this belief Arnold was mistaken, as subsequent events would prove. Tryon's force marched south on the Ridgefield Road into Wilton, where they took prisoners and looted several houses. Some of the Wilton militia under Lt. Seth Abbott (no relation) were with Arnold and had taken losses at Ridgefield, but others were gathering and more American militia were on the march to intercept the British including Col. Jedediah Huntington and the men who had relinquished Danbury to the invader and were now looking for vengeance. "At the bridge over Comstock Brook, they found and destroyed 100 barrels of rum, several chests of arms, many cartridges (bullets and powder wrapped in paper), 300 tents, and the forge and bellows of Captain Clapp Raymond, a blacksmith. All of this had been hidden there for safekeeping, as the Americans did not expect the British to take this route. At Captain Raymond’s house (249 Danbury Road, moved to 224 Danbury Road in 2001), they attempted to set fire to his barn, but a Tory neighbor and her Indian slave put out the fire. Raymond later claimed damages of £34 3s. 10d. Tryon then marched his troops up Dudley Road (Westport Road did not exist at the time), pausing to loot the home of Lieutenant Seth Abbott, to the extent of £55 7s. 3d. in damages." These were not random acts of looting, but appear to have been targeted against local patriot militia leaders. It is clear that the British benefited from intelligence provided by area Tories, and perhaps from some of the 300 who served in the expedition in the loyalist Prince of Wales American Regiment. Such intelligence would be invaluable to Tryon as his column approached the Saugatuck. One source claims Colonel Huntington attacked the British column at this point near the ridge of Chestnut Hill, which offered clear views toward the Sound. It also revealed that Arnold's force held the Old Kings Bridge over the river. With enemies gathering behind and the river between them and safety, Tryon was in a tight spot, but again he was served by those with local knowledge who knew of a nearby ford two miles upstream- though crucially, Arnold did not - where today it is even possible to bicycle across the stream. The British detoured again on what is now called RedCoat Rd. and crossed the river unopposed at the modern intersection of Ford and Clinton Rd. Arnold failed to shift his front to intercept and Tryon's column reached the beachhead at Compo Hill, but not for want of trying. "As soon as they were within reach of a six-pounder - he [Arnold] ordered a shot to be thrown among them which halted the whole first division, and the second [shot] put them into some disorder as it overset some of them. On which when, the second division came up, it was determined by them to take a left hand road which led over a fording place..."
McDevitt states that General Erskine made a show of force before the bridge, pushing two regiments forward while the rest wheeled to the left and made for the ford. Arnold could not shift to defend the ford without exposing his own flank. The British observed that Arnold attempted to cross the bridge but was not followed by his men. The 4th (King's Own) were left to hold the north side of the bridge while the rest of the British made for the shore, and were pressed so hard by the rebel troops that they were nearly cut off, but in the end they gained the shore. There was still the challenge of reembarking, and the Americans had been reinforced and now possessed artillery of their own. In addition to a militia company from Fairfield with one cannon, there were four more under Lt. 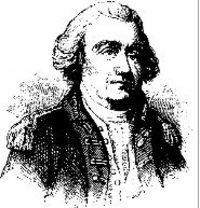 Colonel Eleazer Oswald - Arnold's former aide in his March to Quebec who was captured in the doomed assault of the lower City in December 1775 - now leading two companies of the 2nd Continental (Lamb's) Artillery. Colonel Lamb was also on hand, having ridden 60 miles from Southington when the alarm reached him. Certain DAR Lineage books place my ancestor Thadeus Thompson at Compo Hill with Lamb's Artillery, but I have come to believe this is wishful thinking. Young Thompson (and he was young, born in 1762) did indeed serve under Lamb from Valley Forge to Yorktown where he was maimed by a shell that struck the facines he was carrying, but his enlistment was not until 1778. The American reinforcements now included 60 horsemen from the 1st Troop of the 3rd Connecticut Cavalry, Colonel Huntington's Danbury force, 3 additional companies from New Haven, and at least one tired rider from Sharon, CT - the previously mentioned and ill-fated Lt. Samuel Lawrence. With these troops and the defenders of Ridgefield, there were perhaps 1,200 Americans to contest the British evacuation at Compo Hill. 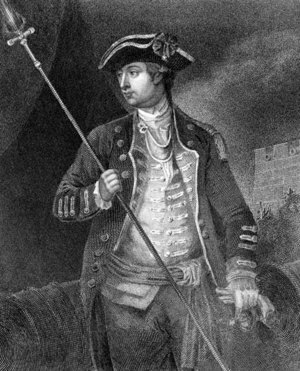 Anticipating the need for assistance of his own, Tryon send his redoubtable second in command Sir William Erskine ahead of his column to secure the beachhead and some sources (but notably, not McDevitt) claim he brought cannon, sailors and marines from the ships to augment his force on land. McDevitt makes the case that the British held the shore with the force at hand. "seeing that his men were disposed to retreat, leaped upon a stone wall and shouted ' for God's sake, men, don't retreat, don't run, let's march up the hill and drive them off.' At that instant he fell shot through the body saying to George Pardee who was near him ' Uncle George I am a dead man' and immediately expired." Out of ammunition, the British counterattacked with the bayonet. Elements of the 4th, 15th, 23rd and 27th regiments took part in the charge, with Major Stewart and a dozen men reportedly leaping the wall and initiating a general charge by the rest. Whoever initiated it, the charge proved effective and compelled the patriots to withdraw. The embarkation then proceeded without further impediment,, again despite Arnold's efforts to rally the militia to oppose it. The British losses among those who made the raid were about 150 casualties. The loyalist Prince of Wales American Regiment lost 1 drummer and 6 rank & file killed; 3 officers, 3 sergeants and 11 rank & file wounded; plus 3 rank & file missing. Its commander Montfort Browne was slightly wounded, though Captain Daniel Lyman of the regiment's Light Infantry Company was shot through the body and never fully recovered. The 64th Regiment of Foot had Captain Carter, Ensign Mercer, and eleven men of the 64th wounded. American casualties are much harder to determine, though estimates range between 100-125 (plus more than 40 captured) and General Wooster and Lt. Colonel Gold slain. The American loss in personal property and war materiel was much greater, culminating in houses burned near the beach as they embarked and including the stores at Danbury, which amounted to 1,700 tents, 4,000 barrels of beef and pork, 1,000 barrels of flour, rice, hospital stores, engineering tools, 5,000 pairs of shoes and stockings, a printing press, rum, molasses, sugar, wheat, and Indian corn. "Sir: I have been waiting with much anxiety to hear the result of the expedition against Danbury, which I never was informed of 'till this minute. The inclosed Copy of a Letter from General MacDougall and of Several Others, which he transmitted, will give Congress all the intelligence, I have upon the Subject. I have only to add and to lament, that this Enterprize has been attended but with too much success on the part of the Enemy." "General Arnolds promotion gives me much pleasure; he has certainly discovered, in every instance where he has had an opportunity, much bravery, activity and enterprize. But what will be done about his Rank? he will not act, most probably, under those he commanded but a few weeks ago." Indeed, though they also awarded him a horse with all necessary equipment to replace the one lost at Ridgefield, Congress only dated Arnold's commission to that February when he was initially passed over for promotion, the resentment of which festered and contributed to his eventually turning traitor. Where martial flames, and Christian virtues join'd. Inly serene the expiring hero lies. Accolades and propotions were also forthcoming for Colonel Jedediah Huntington, who later that year commanded a brigade of Connecticut Continentals under Washington, and for Lt. 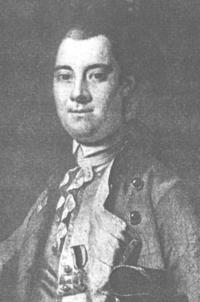 Colonel Oswald, praised for his handling of the guns at Compo and lauded once again in 1778 for his service at Monmouth. As for the militia, their defense of Connecticut during Tryon's Danbury Raid would assume the proportions of myth - their own Lexington and Concord, giving the redcoats "ball for ball." The truth is that the milita and those continental units on hand fought well and were well lead. Not all of them arrived in time to fire on the British but all (save Arnold, who had reason to resent their conduct) had the sense that they had done what was required to see them off. The raid also showed that forces from neighboring states would rally to defend the other. While the British never again penetrated deep into the state, their subsequent coastal raids were probably more a reflection of the lack of suitable inland targets than the need for a quick getaway. Nonetheless, as long as the militia were willing to rise and swarm, though it took the British several more years to fully realize this, the royalists could raid but they could not hold the territory through which they marched. "Gather every available man and march in pursuit to intercept and give battle." This was the message carried throughout western Connecticut and nearby New York in response to Tryon's Danbury Raid in late April, 1777. Some, like Benedict Arnold and David Wooster, were fast on the heels of the British and their Loyalist allies. Others marched from farther afield. As with the Lexington alarm two years previously, many militia units and individuals turned out, but not all of them arrived in time to drive the British back. The alarm reached Sharon, Connecticut, deep in the northwest corner of the state, sayting that the British were burning Danbury. More than 100 men set off down the Housatonic Valley, among them, Lieutenant Samuel Elmore, Jr., on leave from the Northern Department where he served in the Continental Regiment of his father, Colonel Samuel Elmore. Young Elmore arrived home on the very day that word of Tryon's raid reached Sharon. He must have had a swift horse, because he reached the shore on April 28th in time to participate in the final attack on the withdrawing British and where unfortunately he lost his life. "His regiment was disbanded, its members scattered at their homes, many at considerable distances. He must stay there, to muster all who came in. The messenger from Danbury could ride no more, and there was no neighbor within call. In this emergency he turned to his daughter Sibyl, who, a few days before, had passed her sixteenth birthday, and bade her to take a horse, and ride for the men, and tell them to be at his house by daybreak. Imagination only can picture what it was a century and a quarter ago, on a dark night, with reckless bands of 'Cowboys' and 'Skinners' abroad in the land. But the child performed her task, clinging to a man's saddle, and guiding her steed with only a hempen halter, as she rode through the night, bearing the news of the sack of Danbury. 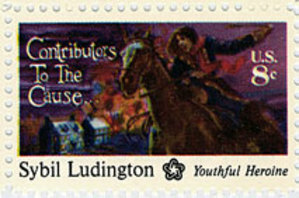 There is no extravagance in comparing her ride with that of Paul Revere and its midnight message. Nor was her errand less efficient than his. By daybreak nearly the whole regiment was mustered before her father's house at Fredericksburgh, and an hour or two later was on the march for vengeance on the raiders." The "memoir" goes on to tell how the regiment reached Redding in time to join up with Arnold and Silliman and fought at Ridgefield, but this cannot be, as Arnold and Silliman spent the night of the 26th at Bethel, not Redding, and moved out in the morning to intercept the British at Ridgefield. Redding is East of Ridgefield, so the Dutchess men need not have gone there to meet up with the defenders of Ridgefield. Henry Noble MacCracken in his 1956 history Old Dutchess Forever!, describes Sibyl Ludington's forty mile ride on the 26th but adds "This, at least, is the tradition of the family (pg. 386)." 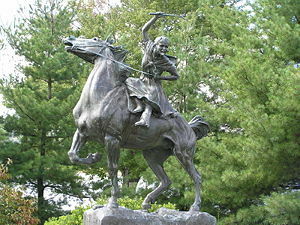 He also has the Dutchess men at the Battle of Ridgefield, but notes; "It must be added that Connecticut records at Ridgefield make no mention of Ludington's aid." 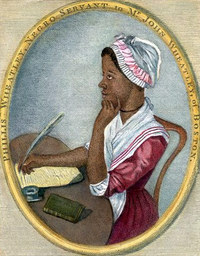 J. L. Bell of the blog Boston 1775 is skeptical about Sibyl's ride, observing that there is no record that she made it, nor that the Dutchess Regiment fought at Ridgefield, written before the 20th century. In researching this post I did find one mention slightly older than the 1907 "memoir" that was written in 1896, but Bell's point still stands. I believe it is quite likely that Ludington's regiment did march early on April 27th, but not that it reached Ridgefield, more than 20 miles distant, in time to take part in the battle early that afternoon. As for Sibyl's ride, it could have happened, and many people believe it did. I can shed no more light on the matter. So who did oppose the British at Ridgefield? To answer that, we must return to April 26th and the rain-soaked encampment at Bethel, three miles from Danbury of Major General David Wooster, Brigadier General Benedict Arnold, Brigadier General Gold Selleck Silliman, and between 500-600 militia. General Wooster decided to split his forces to intercept the British should they return by Ridgefield rather than the Redding road, and so sent Arnold and Silliman across country with about 400 men from the Fairfield militia for this purpose. He kept 200 men with him, and planned to strike the rear of the enemy column when the opportunity offered. Arnold and Silliman reached Ridgefield about 11:00 a.m. on April 27th and heard firing to the north along the road to Danbury that told them of the British approach. Here they found Captain Ebenezer Jones with several dozen raw recruits from the 1st Ridgefield militia. There were some New York militia there as well but these were from nearby North Salem, New York - a company of 50 men from Colonel Samuel Drake's 3rd Regiment of Westchester Militia under Captain Samuel Lawrence. Finally, there were some continental troops under Ridgefield's own Colonel David Burr Bradley, the dark haired cousin of Aaron Burr and commander of the newly re-established 5th Connecticut Continental Line. This was a three year's regiment and recruiting had been very slow to fill its quota. There were not more than 50 men with Bradley, but among them was my ancestor, and Ridgefield native, Lt. Ebenezer Olmsted. This was all the force at hand, and Arnold set about erecting a barricade of wagons and ox carts across Ridgefield's broad main street to wait for the British. Tryon, meanwhile, had left Danbury still in flames early that morning, electing to return to the ships via the Sugar Hollow Rd. toward Ridgefield. The Ridgefield, Conn 1708 - 1908 Bi-centennial Celebration says; "After the conflagration, pork fat was deep in the streets" following the British raid on Danbury. The colum included 5 ox teams, 50-60 cattle and about the same number of sheep. 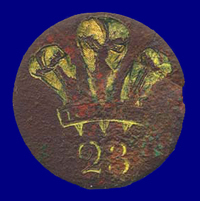 The rearguard were the 23rd Royal Welsh Fusiliers in their high bearskin headgear, and this may be the reason that some in Ridgefield took them for Hessians in mitre caps. The end of the column had reached Ridgebury when Wooster swooped out the woods about three miles north of Ridgefield and crashed into Tryon’s rear guard as it paused briefly for breakfast. Killing at least two redcoats, Wooster took about fifteen prisoners in this first engagement, then vanished back into the trees. With Wooster using hit and run, swarming tactics, Tryon ordered three of the expedition's six cannon to the rear, served by the 4th Battalion, Royal Artillery. A mile down the road General Wooster attacked again, but this time the cannon made the difference. As he rallied his men, Major General Wooster was struck in the groin and fell from his horse. His inexperienced militia broke, though his men had the forethought to strip off his General's sash as they bore him away to Danbury where he died five days later. 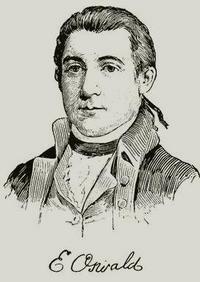 Captain Stephen Rowe Bradley eventually pulled the militia together and continued the pursuit. The British pushed on down Ridgefield's mile-long center street in a solid column with the other three cannon up front and flankers to either side. It was a little after noon. They found a strong force of 500-600 men opposing them. There were a number of excellent American officers at the barricade as well, and they had posted additional men to guard their flanks. The British tested the defenders and were pushed back, then began a sharp engagement including close combat and the cannon which blasted the barricade and several nearby homes. The British advanced on three sides and hurled a 600-man column under the command of Sir William Erskine against the barricade. Lt. Colonel Alexander Gold ,who lead the Fairfield militia to Ridgefield, was shot from his horse defending the barricade and fell dead "with bloody sword." The British broke through but at the cost on each side of more than a dozen killed and twice that wounded. The Patriots gave way but under Arnold's direction made a running fight down the broad street. The General was characteristically brave to the point of recklessness, but finally a volley of nine bullets struck and killed his horse, pinning him to the ground. As he struggled to untangle himself, one of the Royalists rushed forward with the bayonet shouting "Surrender, you are my prisoner!" Arnold replied "Not yet", and freeing one of his pistols shot the other dead and managed to escape unscathed into some nearby bushes. Arnold and Silliman withdrew to the south of Town and the third and final phase of the Battle of Ridgefield ended. The British burned half a dozen buildings in Ridgefield, but though it had been pierced by seven cannonballs (one of which remains embedded to this day) and was initially set alight, they spared Timothy Keeler's tavern when a Tory neighbor feared the flames would spread to his property. Later this loyalist told his townsman; "You may thank me that your house is safe." Keeler retorted; "No sir! I will not thank a Tory for anything. I thank the Lord for the North Wind." The British camped south of Town that night, burning a house to signal the ships waiting for them in the Sound. Engineer officier Captain Robertson recorded their losses in the three parts of the battle as "50 or 60 men Killed and Wounded and 4 or 5 Officers, Major (Henry Hope, Captain Rutherford, etc." All around them, the countryside was marching. Arnold and Silliman and their men would be joined by others, and already were planning how next to block the British. We will discuss the final act of Tryon's Danbury Raid tomorrow, the anniversary of the concluding fight at Compo Hill. Opposition to the British landing at Cedar Point happened as the troops assembled on Compo Hill. Some of the inhabitants began to fire on the redcoats and their loyalist allies, and General Tryon responded with infantry and artillery fire, including a very long musket shot that instantly killed one of the Connecticut defenders, and a cannonball (said to be a 9 pounder) that crashed through the second floor of the Kent family's house and struck the chimney. This incident set the tone for Tryon's Danbury Raid, with militia harrying the British in small but increasingly numerous groups and the British using their ordinance and heavy musket volleys to clear the way. 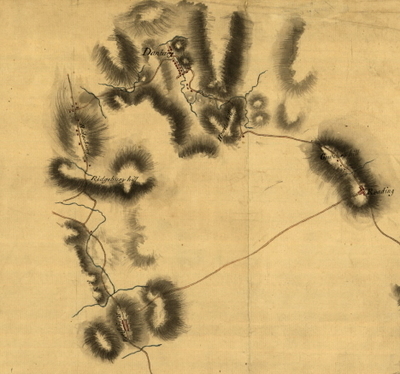 "[Captain Disbrow] was home on furlough when he learned of the movements of Tryon. He gathered about 30 men [others say his "Gallant 17", Ed. ], stationed them in a sheltered position, and as the British advanced in the moonlight they challenged with "Who goes there?" The answer was: "You will know soon." The Americans thereupon fired and a number of the enemy fell; the advancing column returned the fire, wounding one American. The British secured an ox-cart and returned their dead and wounded to the vessels." The British casualties were in the loyalist regiment that lead the column, Captain Lymond of the light infantry company and 5 or six others. The Captain and two of the injured were taken back to the ships. The others continued on the march. "The invaders encamped that night in the northern part of the town of Fairfield. Early the next morning, the troops resumed their march, Tryon breakfasting with a Tory in Redding." It is curious that the British would march a few miles in darkness and then encamp after meeting light armed resistance, rather than pressing on toward Danbury. It may be that the article has this part of the story wrong, along with the moonlight on a night with light rain. More likely, they kept their march and reached Redding (20 miles from the beachhead) in time for Tryon's breakfast. It is certain that the patriots did not rest that night, but mustered the forces nearest at hand and called in support for much farther afield. "mounting his horse, formed the men in line on the village green as they came pouring in by two and threes, in squads and companies. By nightfall 500 men had been collected, and the the regiment slept on its arms with orders to march at daybreak." Others heard the call and hurried to take part in repelling the invaders. Brigadier General Benedict Arnold was at his sister's home in New Haven, furious at having been passed over for promotion after his defense of lake Chaplain the previous fall, but he quickly grabbed a horse and with a few others rode hell for leather toward Redding. Along the way he met Connecticut militia Major General David Wooster, who he had known during the failed invasion of Canada in 1775-1776. Together they had perhaps 100 men when they met up with Silliman and Gold with the 4th Militia at Redding on the afternoon of April 26th. The British had already reached Danbury ahead of them, and as the rain was heavy and they decided to wait the night at Bethel three miles from Danbury and then plan to waylay the raiders on their return to Compo Hill. The British had reached Danbury in the early afternoon of April 26th, though not without incident. In Weston, Zalmon Read's militia Company stumbled into the British vanguard in the dark and were taken prisoner. A lone horseman waving a sword and shouting as if to an unseen force confronted the British in the morning and delayed their march. Lt. Lambert Lockwood, carrying a message from the defenders of Danbury to General Silliman, encountered the British when they paused in Redding and was wounded and captured, while another patriot was shot dead as the British left the town. Danbury was commanded by Colonel Jedediah Huntington of Norwich, CT, whose garrison consisted of 50 regulars from his 1st Connecticut Regiment and 100 militia, and these along with another militia company under Col. Joseph P. Cooke where all he had to oppose the British. after bringing off just a few of the store and leaving a small rearguard to delay the British, Huntington withdrew to the hills above the town to wait for a better opportunity. Tryon's men used cannon to clear the streets after they were fired on from a house (subsequently burned with the bodies of the patriot defenders, one of whom was black). The 17th dragoons chased a man with a bolt of cloth under his arm throughout he town, and the regulars soon found that along with considerable military equipment including a large number of tents, the the depot at Danbury stored a large supply of rum. What could not be burned in the streets was piled into barns and set alight. In the end, the meeting house, all the town records, 19 houses and 22 storehouses were consumed by the flames, with those of the loyalists spared. The morning of the 27th saw part of Danbury a smoking ruin, but the British could not linger, for they had news that the countryside was in arms, and Wooster and Silliman just three miles behind them in Bethel. They decided to return to the shore by a circular route, taking to road to Ridgefield close to the border with New York. It was a much harder road than the one they took inland, starting with the Battle of Ridgefield later that day. We'll have more to say about that battle, and who fought there, in tomorrow's post, its 231st anniversary. On this date in 1777, a British fleet consisting of two sloops, (Senegal and Swan), the brig Halifax, a dozen transports, a hospital ship, and upwards of ten smaller vessels lay off the coast of Connecticut. More than 2,000 British and loyalist troops came ashore on the beach at Cedar Point near the mouth of the Saugatuck River and assembled on nearby Compo Hill. Their objective was the Continental supply depot at Danbury, some 25 miles inland, and their leader was New York's colonial governor William Tryon who held the the local rank of Major General. Tryon's Danbury Raid would prove to be the largest engagement in Connecticut during the American War of Independence. 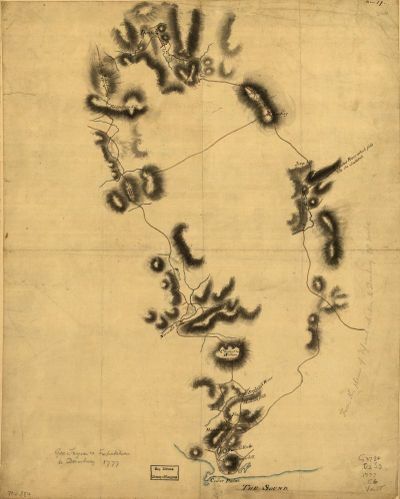 During the next three days, Tryon's raiding force would lay waste to Danbury and fight two sharp engagements with the patriot forces: first at Ridgefield and back again at Compo Hill. Along the way, Benedict Arnold would earn a belated second star for his heroism, patriot General Wooster would become another of the revolution's martyrs, and a young girl from neighboring New York would ride into legend. Commemorations of the the Danbury Raid and subsequent memory have sometimes obscured the actual history. Both the British and the Patriots claimed success, though the near term results clearly favored the invaders. The descendants of two of my revolutionary ancestors - Ebenezer Olmsted of the 5th Connecticut Continentals and Thadeus Thompson of Lamb's Artillery - subsequently claimed these forebears were involved in repulsing the British invasion, but the evidence exists for only one of them to have done so. On this 231st anniversary of Tryon's Danbury Raid, we will study this event and see whether we can clear up some of the ambiguities in how it is remembered. We'll begin with the Bfritish order of battle. We can be far more confident about the composition of the British forces involved than the continental and militia units that rallied to oppose them as the raid progressed. 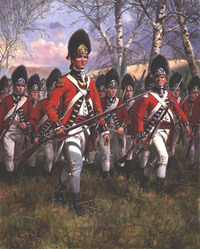 The corp of Tryon's invasion force consisted of between 200-250 men taken from each of six British regiments, the better part of two brigades from Sir William Howe's army in New York. The First Brigade was under the command of Brigadier General James Agnew, who was later wounded at the Battle of Brandywine and killed shortly thereafter at Germantown. When Howe planned the raid, Agnew had been considered second in command, but that role was ultimately given to the Quartermaster General of the British Army in America, Sir William Erskine. 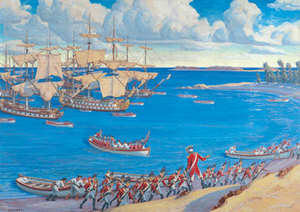 Agnew's Brigade for this expedition included several companies of the His Majesty's 4th Regiment of Foot (Kings Own), the 15th Regiment of Foot, and the 23rd Royal Welsh Fusiliers (shown below in a painting by Don Troiani). The other British brigade consisted of detachments from the 27th Inniskillings (whose flags appear at left) and the 44th and 64th regiments of foot. The two royal regimentswere old and venerable units that had seen hard fighting during the return to Boston from Lexington and Concord. Their light and grenadier companies were in the thick of the fight at Bunker Hill. The 15th were among the reinforcements sent from Ireland in 1776 for the invasion of New York. They were issued short jackets, gaiter coveralls and parred down hats for their American service, and along with the rest of their brigade fought at Long Island, Harlem Heights and White Plains. The 44th had served under Braddock during the French and Indian War and carried the memory of the massacre at Monongahela. The 64th (illustrated at right) wore black uniform facings and their Grenadier company was part of the detachment that took part in Tryon's raid. They had been part of the Boston garrison as early as 1768, and under its Colonel Alexander Leslie shed first blood at Salem Mass in February, 1775, three months before the shot heard round the world. They, too, had served through Long Island, and just a month before been involved in another British raid on colonial supplies, this time at Peekskill, New York. The rest of Tryon's force included 300 loyalists: the Prince of Wales American Regiment in their new green jackets with white facings. They had been recruited from several states and were led by Monfort Browne, the Royal governor of New Providence, who had been held prisoner in Connecticut for a time until exchanged for a Continental general taken at Long Island. There were also a dozen troopers from the 17th Light dragoons under a subaltern, with the death's head embroidered on their plumed caps. 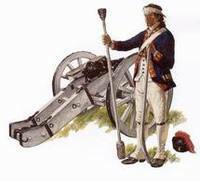 Significantly, and unlike the expedition to Lexington and Concord, the British brought with them a detachment of the 4th battalion, Royal Artillery with six cannon. These would play a significant part in the raid. There is some disagreement as to the type of ordinance used - anything from 3 to 12 pound cannon have been mentioned by later historians. Considering that a cannonball remains in the corner post of the Keeler tavern in Ridgefield that was fired during the battle that was fought there on April 27th, this ought to be something I can confirm on my next drive downstate. Contrary to later accounts and claims that two Hessians were mortally wounded at Ridgefield, I am unaware of any contemporary evidence to confirm that British force included German mercenaries. Ridgefield's Hessian Drive was so called because two skeletons thought to be those of Hessians were unearthed in sandpit in that vicinity in 1874. 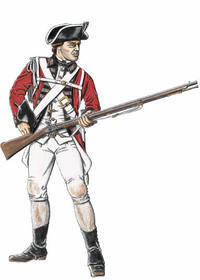 The British landed in the early evening and were on the road to Danbury by 10 that night. As their destination became apparent, express riders fanned out to the north, east and west to raise the alarm and turn out the militia in defense of the state. We will discuss the British route of march, how far the alarm traveled, and the patriot response in tomorrow's post.